Thinking about how to make miso soup? It's not as hard as you think! This simple, nutritious Japanese soup takes only a few minutes to prepare and makes an excellent appetizer, end course, or light lunch. If you don't normally shop at a grocery store that stocks Japanese food products, the hardest part may be rounding up the ingredients. Once you have them in hand, making the soup is a snap. 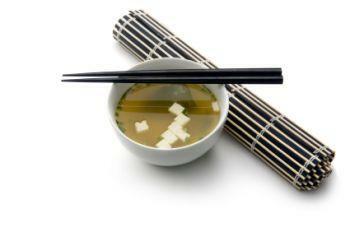 Many varieties of miso soup are made with dashi, a Japanese fish broth, and are thus not vegetarian or vegan. However, vegetarians can use seaweed broth, mushroom stock, or other types of dashi to prepare meat- and fish-free varieties of miso soup. Miso soup has only a few whole ingredients that combine to give the soup a clear, simple flavor. 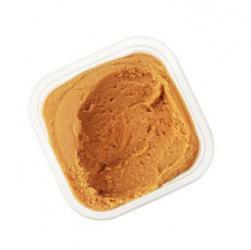 Miso paste is a traditional Japanese ingredient that is made from fermented soybeans. It's considered to be a flavor enhancer and is used in small amounts to season stews, soups, and other dishes. Miso paste is used to make miso soup. If you are a vegetarian and would like to buy pre-made dashi, check with your seller before you purchase to make sure that the dashi does not contain any fish ingredients or fish flakes. You can also make your own dashi using vegetarian ingredients. Dashi is a staple broth for the Japanese and forms the base of a majority of soups. Tofu is a main ingredient in most miso soup recipes and provides a good source of protein for vegetarians and vegans. Slice the tofu into small cubes, and slide them into the simmering miso broth as it heats up. If you stir gently, the cubes should stay intact instead of crumbling. Wakame is a variety of Japanese seaweed that is commonly used in miso soup. It's so common that sometimes it is simply called "dried seaweed,", and vegetarians should be able to find it at any Japanese grocery store or large grocery store with a section of Asian foods. Green onions, also called scallions or spring onions, are used as a garnish for miso soup. Slice several fresh green onions very thinly, and garnish finished bowls of miso soup with the slices. Serve immediately after garnishing. Carrot, onion, parsley, and other fresh vegetables and herbs are sometimes added to the simmering miso broth or the finished soup. If you are concerned about the traditional way of how to make miso soup, you may want to stick to essentials, but feel free to add these or other ingredients to flavor the soup according to your preference. Making this soup is simple. Heat the dashi until it is very warm. Rehydrate the dried wakame by soaking it in hot water for about a half hour. Slice fresh tofu into small cubes. Scoop out a tablespoon or two of miso paste and dissolve it in a small amount of the hot dashi. When the miso is incorporated with the dashi, add it to the rest of the dashi and stir. Add the cubed tofu to the warm miso broth. Add the rehydrated wakame to the miso soup. Heat the soup through until it is warm. Slice several green onions very thinly. Spoon the soup into bowls and garnish with the green onions. Using this simple recipe, you can dish up a warm bowl of miso soup in no time.